Since his 1996 solo debut, Blå Harding, Norwegian Hardanger fiddler Nils Økland has charted a range of melodic waters, always docking at the intersection of traditional and contemporary music. His relationship with ECM has produced a series of artistic statements, each more cohesive than the last. His first for the label was 2009's Monograph, a solo album of great scope that led to 2011's Lysøen, in duet with Sigbjørn Apeland. And now we have Kjølvatn, for which he has assembled a full band under his own name. 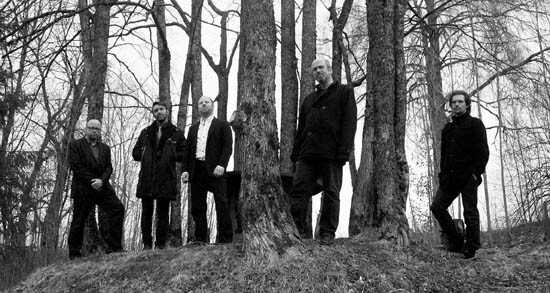 Apeland rejoins the fray, here playing harmonium, along with saxophonist Rolf-Erik Nystrøm, bassist Mats Eilertsen, and percussionist Håkon Mørch Stene. Each has lived in that gray area between folk, jazz, and classical, and funnels his unique experiences into Økland's sound-world like grains of sand through an hourglass. 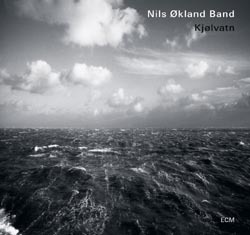 Having worked with these musicians for years in some configuration or another (all except Nystrøm played on Bris, released in 2004 on Rune Grammofon), Økland revisits a trove of older material with special familiarity. A look at even a few of the tunes shows the breadth of his network. He wrote “Mali,” for instance, after attending a concert by Swedish rapper Timbuktu. The band's profiles cohere evocatively in this opening piece, as in the album's title track, a retroactive score for the 1933 Scottish silent film "The Rugged Island." “Undergrunn” (Underground), too, feels quite integrated, arising as it did from a collaboration with the London Sinfonietta around folk motifs. Such diversity of origins suggests that Økland's influences are as complex and fragmentary as life itself. Økland employs a variety of open tunings on the album, each of which has its own special name. The “dark blue” tuning (D-D-A-D) is heard on the processional “Drev” (Drifted), wherein are bolded Stene's percussive colors, and “Start” the so-called “troll tuning” (B-E-B-D#). In the latter, Økland combines ancient structures and modern minimalism, both of which he sees as relying on short motifs multiplied to form larger structures. Økland has been increasingly inspired by the viola d'amore, which like his mainstay instrument has extra strings that vibrate sympathetically beneath the main four, and on the tracks “Puls” and “Skugge” (Shadow) he draws a darker soul from this cousin. In the former piece, the heartbeat is evoked by Stene on kettledrum, while Eilertsen explores kindred frequencies. Over this, a flight from Økland's bow touches the ocean with a wingtip in search of nesting territory. Location matters a lot in Kjølvatn, which was recorded at the Hoff stone church in the countryside of Norway's Oppland county. Økland's go-to engineer, Audun Strype, captures the church's resonant bounce, allowing the rougher, more organic aspects of the performance to exude clarity. One may hear this especially in “Fivreld” (Butterfly), an alluring piece of ambience in which the harmonium breathes like sunlight through foliage. Made for a ballet performance at Haugesund Theater in Økland's hometown, it veritably sings. Other references to Økland's past are found in “Blå harding” and “Amstel.” Earlier versions of both appeared on the aforementioned debut. The first is something of a blues dedicated to his Hardanger fiddle teacher Sigbjørn Bernhoft Osa, while the second, which closes out the album, is greener, its organ-like harmonium reminding us of where we are.